GeoCHEM GeoKure Wet Curing Blankets are designed to maintain hydration and inhibit moisture loss during the curing process of concrete. GeoKure Wet Curing Blankets are lightweight and disposable providing a simple economical manner to flawlessly cure concrete. 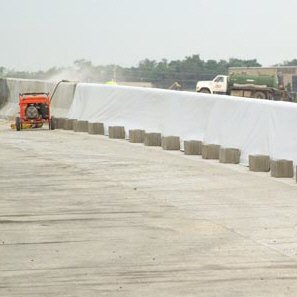 GeoKure Wet Curing Blankets meet and exceed all requirements of AASHTO M171 and ASTM C171. Available in convenient 9’ x 250’ rolls. GeoKure Wet Curing Blanket is manufactured with highly absorbent synthetic needle-punched fabric coated with a bright white reflective film. Unlike burlap, it prevents mold growth and rot. GeoKure blankets are lightweight and disposable making them an economical choice in concrete curing, and yet are versatile and strong enough to be reused when cared for properly. GeoKure surface is highly reflective and the fabric is specifically designed to be hydrated and inhibit moisture loss during the concrete curing process. Click here for Product Data Sheet.